So true! That's why I can't go to bed sometimes. I imagine what the character might do, and it keeps me awake all night. Yikes! Me too. I begin to imagine what will happen, what the characters will say to each other, etc. etc. I think that's part of the reason why I started writing. Books never went the way I wanted them to go! Love writing my own books and having the plot go the way I want! So fun! Thanks, Charissa! It is! 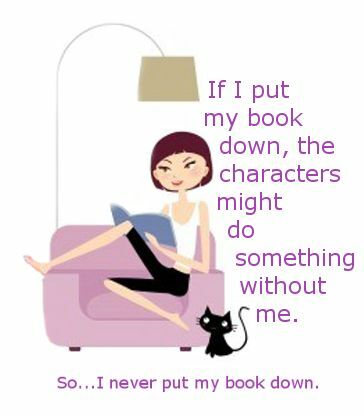 Just once I want to re-read a book or watch a movie and have it go differently, but, alas, it never happens. Thanks for your comment, Christy! Perfect and so true! That's exactly how I feel! That's why my kindle is my best friend! I just signed up for your blitz tour for For Nick! Yay! Thanks for being a part of my book blast for For Nick! I love my kindle too. Thought I was a die-hard paperback lover, but nope, I LOVE having a kindle and having all of my books in one place--easy to carry, and I can have lots of books with me at once. LOVE! Thanks Laura!